my friend over at bon chappetit made some banana pancakes a while back and since then, i came across another banana posting in my local news paper. since seeing those posts i’ve been wanting to make pancakes for breakfast and so i did. while i didn’t make my batter from scratch like bon chappetit, i am still happy with how they turned out. 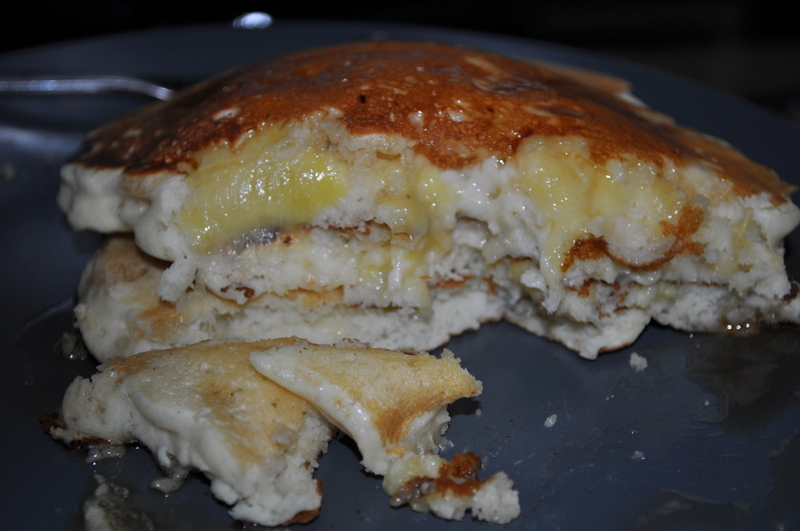 i made a HUGE batch of pancakes, some plain and some banana. feeds many mouths. heat non stick pan or griddle on medium high heat. whisk all ingredients, except banana. start making your pancakes! i made about 8 small ones plain and then mashed the banana into the remaining batter and made three medium sized pancakes. the trick is to let the pancake sit until the bottom has formed. flip. serve. nothing says good morning like the taste of a sweet, warm, caramel-y banana bite in your pancakes. i saw this article on my local newspapers website Sunday. i was already intrigued with making some pancakes from bon chappetit‘s post and seeing that link made my desire grow. i didn’t do anything about it today, but i will eventually… maybe this weekend. anyway, it was a good post to share, at the least. i’ll post my results when i get them. nothing new to update – made another chicken salad a la pittsburghese by request. it’s so easy, simple and delicious. and cheap!